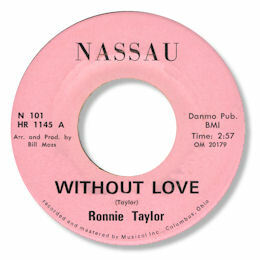 Without Love is one of those oh-so-simple songs that have often have a far greater emotional impact than they should have. It really is just a small group (superb organ playing) and Taylor emoting his own romantic lyric. Just check out his throaty roar towards the bridge - super. You can barely hear the horns so low are they in the mix. Producer Bill Moss was a Columbus, OH DJ who went on to own the Capsoul label - this was one of his very early attempts to get into the record business. Note ~ Is the Ronnie Taylor & His Soul Peppers on Ariel a different artist?